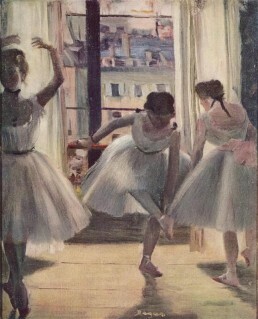 More than half of his works depict dancers. “Yesterday I spent the whole day in the studio of a strange painter called Degas,” wrote Edmond de Goncourt in 1874. For all his ‘strangeness’ and abruptness Edgar Degas is widely regarded as being before his time and having a vision that surpassed his peers and intimidated them. 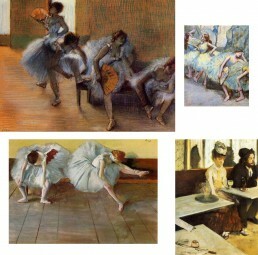 Degas liked to capture strange postures from unusual angles, this is seen keenly in his ballet paintings. Usually, when we think of ballet – we think of everything being pristine and perfect. 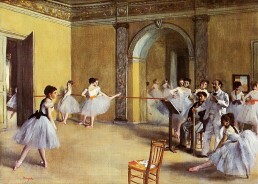 But Degas took inspiration from the sloppy behind the scenes views. The bent and broken bodies of the ballerinas as they waited hunched over in the wings or as they awkwardly stretched before their performance. Degas took this fascination with the ugly side of beauty in other paintings such a “L’Absinthe” which features two people at a table and a glass of Absinthe in front of them. It’s sad, and lonely and demoralising. When it was first seen in 1876 – it was called ugly and disgusting and caused a huge controversy due to the seedy nature of its subjects. In fact, it was hidden away from public eye for 16 years. In 1892 it was once again exhibited and this time elicited public boo-ing from the crowd. From these low beginnings, its now proudly on display in the Musee D’Orsay in Paris as one of their finest pieces. Even though we know him best for his dreamy ballerina paintings – there was never an artist more intolerably brilliant than Degas. He was a sufferer for his art and thought that it was his calling in life – he lived and breathed his art to the detriment of everything else in his life. During his lifetime, his persona was legendary. In company, he was known for his wit – which could often be biting, but never catty. He even rivalled Oscar Wilde on quite a few occasions! “I want people to believe me wicked,” he once declared. As he aged, his friends are said to have lamented the fading of his “beautiful intelligence”. But for all of his brilliance – Degas’ journals are laced with self-lacerating comments. He never doubted his genius as an artist, but he doubted his worth as a human being. During the last decades of his life, Degas lived and worked in a large fifth-floor studio in lower Montmartre. He lived a life of solitude, and eventually lost most of his friends – due to his anti-Semitic ideas and argumentative nature. He never married, opposed social change and technological innovations, always painted indoors, and ceased painting by 1912, at which he time he was nearly blind. He died wandering the streets of Paris in 1917. Sleeping beauty.... or femme fatale? I love that he captured the ‘sloppy’ side of things. Life can be portrayed as so perfect but that’s not reality! Love the work. 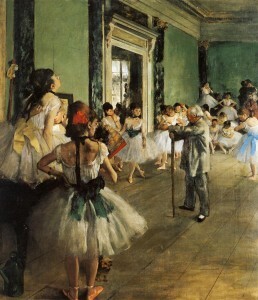 I have a feeling that Degas would not have an Instagram account in today’s world!! No pretty & beautifully curated feeds for him! haha.